It hasn't taken long for the first really interesting buzzword to emerge from the world of iPad. I've just been checking out an iPad app called 'Flipboard', which allows you to compile your own customised magazine by grabbing content from social networks and selected newsfeeds. The brainchild of former Apple iPhone engineer Evan Doll and entrepreneur Mike McCue, Flipboard takes normal RSS feeds and configures them as a newspaper layout, showing headlines, runners and ultimately the full story. Additionally, Flipboard displays Tweets about each article and allows you to add your own comments. You can also import Twitter lists. As the term infers, navigation between sections of content is done by 'flipping', just like browsing through a magazine. Flipboard has a set of nine pre-built curated “boards” which serve as your magazine sections. These are basically templates, but they can be customised. By all accounts it's addictive and makes brilliant use of both Twitter and Facebook - a surefire way to ensure its popular takeup. 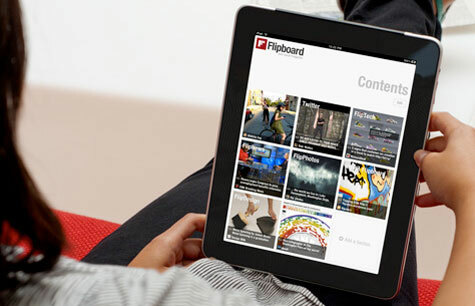 Flipboard is free to download on the Flipboard website.